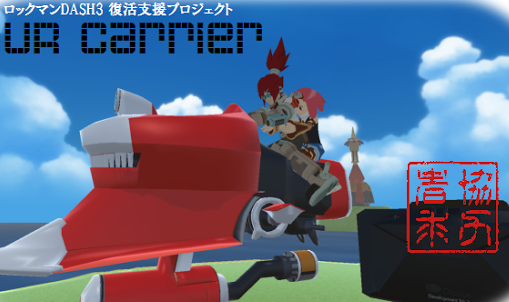 "VR DASH" is an experimental Mega Man Legends 3-inspired project designed for Oculus Rift. The game hopes to put players in the shoes of Barrett and Aero and become, what could very well be, the first VR Mega Man fan-game. It should come as no surprise Mega Man fan games continue to thrive in the absence of official titles. Here's one such project. 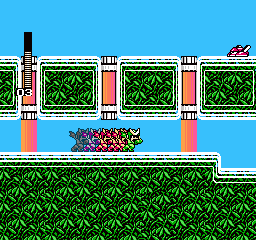 Quint's Revenge, brought to you by Sprites Inc., stars the titular Mega Man from the far future. 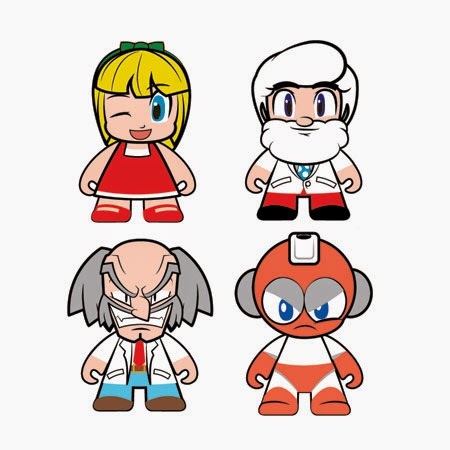 The twist here, Dr. Light knew of Dr. Wily's trip through time to reprogram Mega Man. 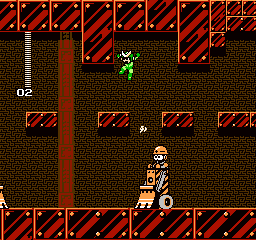 Now free from Wily's control, Mega Man, i.e Quint, sets out for revenge. 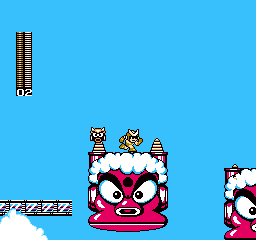 The game adheres closely to Mega Man 2 and 3 but moves at a much quicker pace. The whole game is built around Quint's seldom seen abilities, like Sonic Dash, ducking, and ledge grabbing. It's an interest twist of the tried-and-true NES formula. 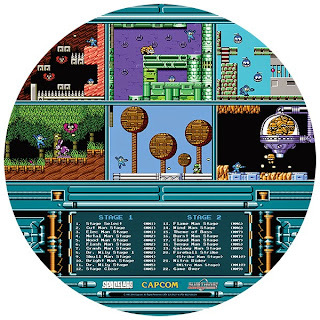 Though still in beta, the game spans fifteen stages (8 Robot Masters, an intro stage, 6 fortress stages). If you like trying out Mega Man fan games, I definitely recommend it! I only sampled it a small bit so far, but I was really taken by the new elements. You can give it a spin here! 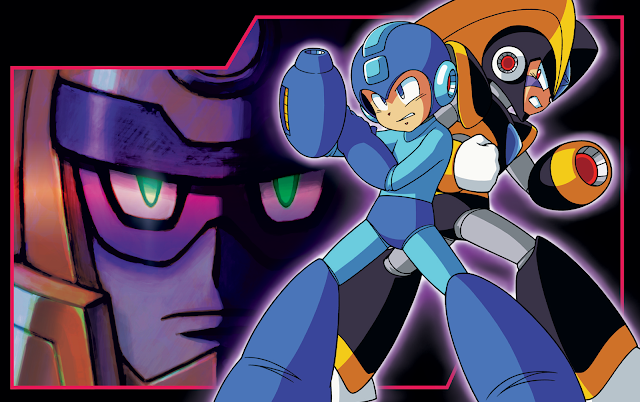 Mega Man Battle Network 4 Red Sun and Blue Moon have arrived on the North American Wii U Virtual Console. For the completionist out there, here's a couple tips on getting the most from these ports. As promised, Mega Man Battle Network 4 Red Sun and Blue Moon have arrived on Wii U in North America. But Mega May doesn't end there! Nintendo surprised us with Mega Man Zero 3 today, too! In total, Mega May 2015 deliver seven games. These classics will run you $7.99 a pop. 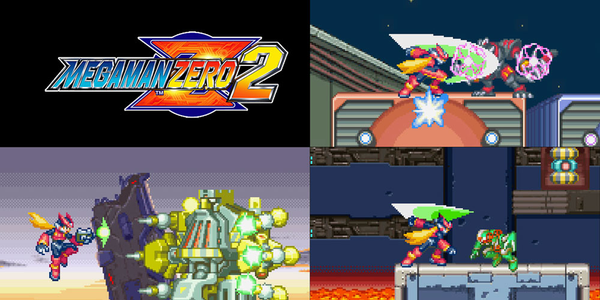 Though not announced officially, Mega Man Zero 4 is on the radar. After that, who knows! A couple weeks back we looked at some of the legal hurdles preventing Mega Man Legends from launching on PlayStation Network. We concluded it has nothing to do voice actors and their contractual agreements; rather, a trio of annoying logos from other people's intellectual properties. Today we're putting Mega Man Legends 2 under the microscope. Can it come to PSN? If so, when? These questions and more observations after the jump. TruForce Collectibles' has revealed the official painted Test Type Mega Man X figure today; a finely detail product exclusive to upper-tier Kickstarter backers. This figure will not be offered anywhere else (save inevitable eBay listings), but that shouldn't stop you from enjoying a few images. You can see more at their Facebook page here. TruForce also revealed Test Type X will ship with special blue effect parts instead of the standard yellow. Upper-tier backers will still be receiving red as promised. Mega Man Amiibo Pattern in Yoshi's Woolly World? So this is pretty cute. If you tap any of the 40 Amiibo available, you can unlock that character's costume in Yoshi's Woolly World. As you can see in the above trailer, the Mega Man Amiibo is supported. 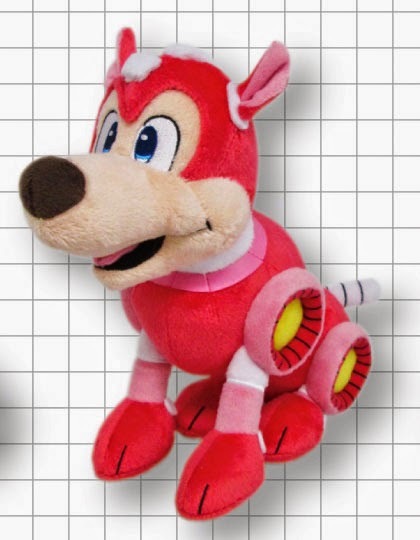 They don't show the Mega Man pattern in action, but it sounds like we'll have the opportunity to play through the entire game as a Yoshi-Mega Man. That is crazy cool. Hopefully we'll see what it looks like soon. Yoshi's Woolly World is due this fall in North America; June 25th in Europe. 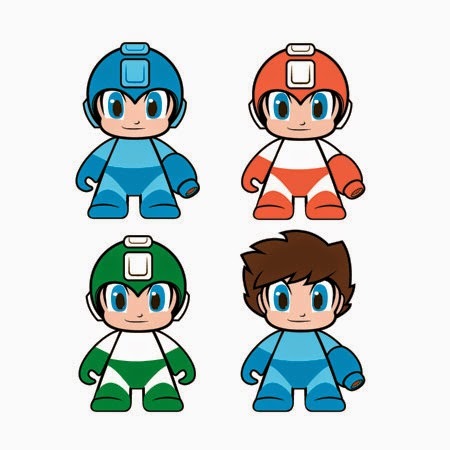 It's been a little while since we last heard anything about Kidrobot's 3-inch Mega Man figures. 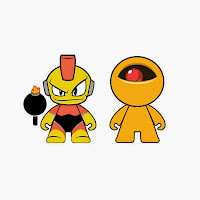 These little guys were thought to be cancelled but now it seems that's no longer the case. They're back and they're headed to a retailer near you this summer. 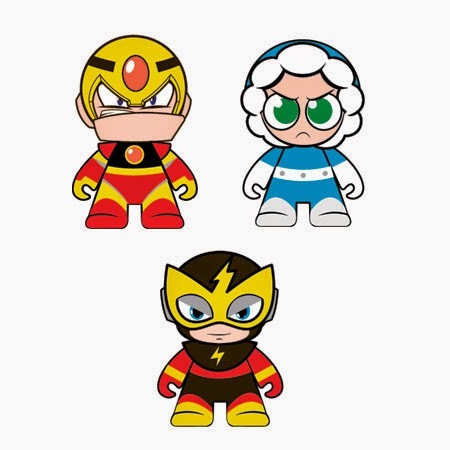 Kidrobot is looking to release the figures in individual blind boxes for $11.99 a pop. Entertainment Earth, meanwhile, has a 5-pack and a display box available to pre-order for $59.99 and $239.99 respectively. Still no images of the physical figures yet, I'm afraid. You'll have to make do with the proof-of-concepts above. Final product may vary. EDIT: Here's a sneak peek. The keychain set is there, too. Do a 'Jump! Jump! Slide! Slide!' because we've got some good news for you. 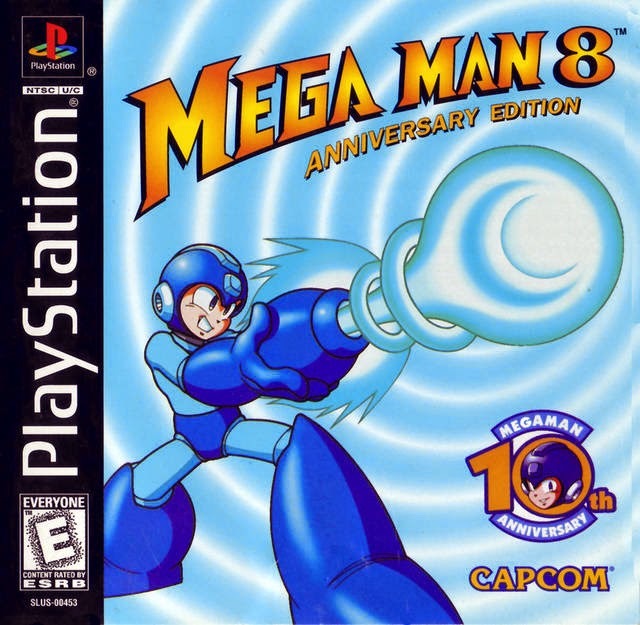 Announced during the latest PlayStation Blogcast, Mega Man 8 is headed to PlayStation Network next Wednesday, May 27th. The game will be playable on PlayStation 3, PSP and PlayStation Vita. Originally released in 1996, Mega Man 8 brought the classic series to the 32-bit frontlines with fluid animation, FMV custcenes (topped with legendary dubbing), and a colorful musical score courtesy of Shusaku Uchiyama. 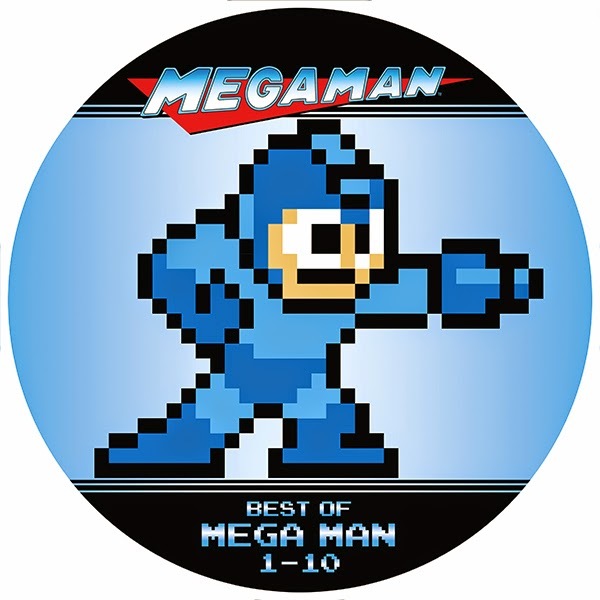 It is one of the few PlayStation Mega Man games to achieve "Greatest Hits" status, selling at least 350,000 units in North America alone. 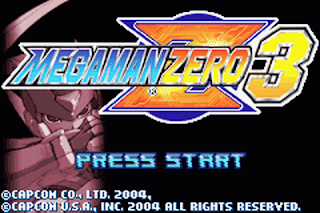 Mega May week three is upon us and its serving up Mega Man Zero 2. The GBA classic is now available on the North American Wii U eShop for $7.99. Zero 3 and Zero 4 are not part of the Mega May lineup this year; however, they're certainly on the horizon. Next week it's Mega Man Battle Network 4 Red Sun and Blue Moon! ComicBook.com brings us our first look at Mega Man #52, the twelfth and final installment in the Worlds Unite crossover saga. There's a lot of spoilers going on here so, if you're interested in sneaking a peek, hit the jump below! 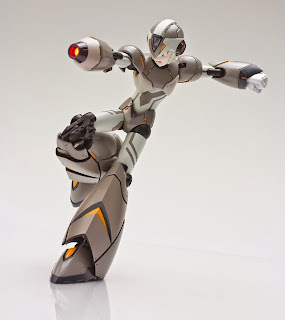 Rockman Corner contributor Undamned has X-Plus Toys' Gigantic Series Rockman in-hand, and he's eager to show you what it's all about. Does it live up to the hype? (courtesy of Bluefin Distribution). We'll have more news on that front soon! 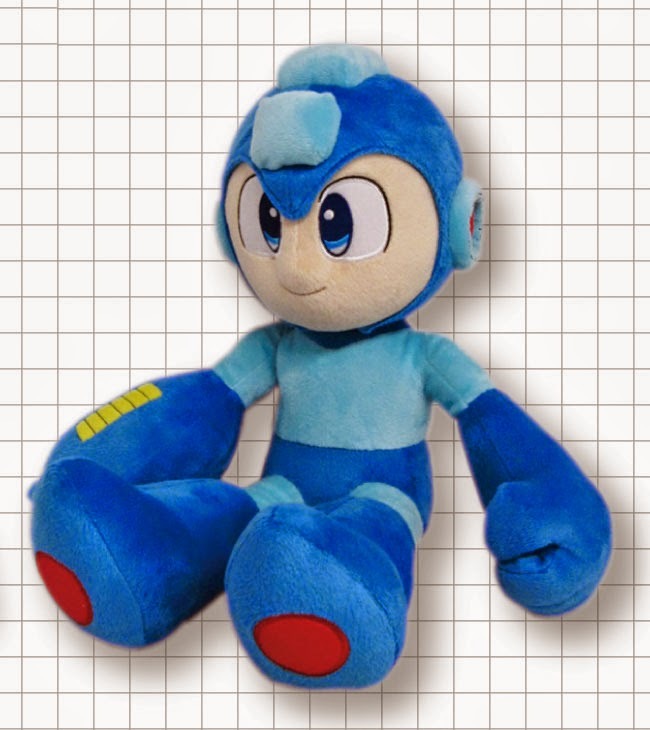 Released in Japan earlier this year, Capcom's Mega Man "All-Star" line of plushies are set to hit North America this summer. These 7 to 10-inch critters are currently available to pre-order from Entertainment Earth with an estimated July launch. I knew this day would come. With so many video game soundtracks going vinyl, it was bound to happen. 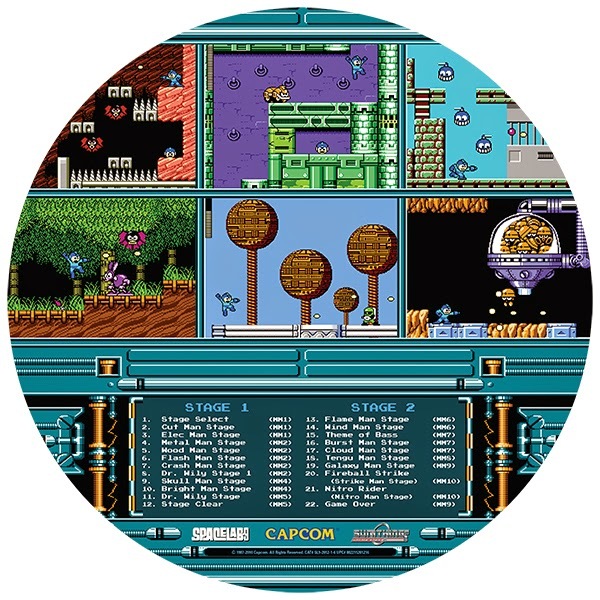 Capcom has partnered with SpaceLab9 to release the Best Of Mega Man 1-10 on "picture disc" vinyl. It will debut exclusively through Hot Topic on May 25th, limited to 1,000 pieces. 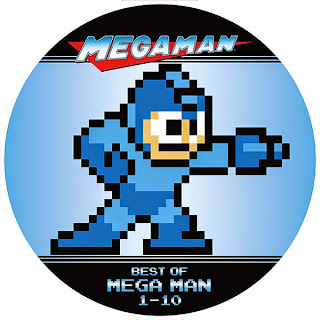 As you can probably surmise, it features select pieces from Mega Man 1-10, 22 tracks in total. So if you're a DJ, vinyl collector, or just want to rock out to authentic pop, crackle and hiss, stay tuned. The history of Mega Man 3's development is a bumpy one. While by no means a bad game, production was strained and turbulent, according to former series producer Keiji Inafune. Due to time constraints and other pesky factors, many of Mega Man 3's ideas were left unfinished; the finer details ultimately glossed over. The game we've come to know is only a glimpse of what Inafune and his team truly envisioned. That's where Kuja Killer comes in. Since 2012, Kuja has been developing a patch to fine tune Mega Man 3 to perfection. And now, three years later, it's finished. "Mega Man 3 Improvement 2.0" brings us dozens of bug fixes, reduces lag by 70%, and re-injects a number unused graphics. 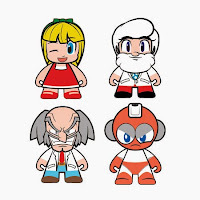 The new introduction sequence by PStart and Mega Man USA has been included, too! Several of these changes and additions are highlighted in the footage above. You can head over here and download the patch. Check out the readme before you go about your business. Enjoy! Mega May 2015 continues with both versions of Mega Man Battle Network 3 on the Wii U Virtual Console. White and Blue versions are now available to download for $7.99 a piece. For the uninitiated, there are four key differences between White and Blue: Giga Chips, Standard Chips, Exclusive Navis you can fight + exclusive Navi Chips, and Style/Navi Customizer blocks related to specific Styles. Check out this FAQ a detailed rundown. It is not possible to trade Chips between versions on Wii U; however, Capcom has provided a method to obtain those tricky multiplayer-only Chips. Just like Battle Network 2, all you need to do is go into "Comm." under the pause menu, save your game and restart. Load your save file and check your Chip folder - voila! You now possess some of the strongest Chips in the game. Good news, Euro friends! You're getting not one but two Mega Man games this week on Wii U! 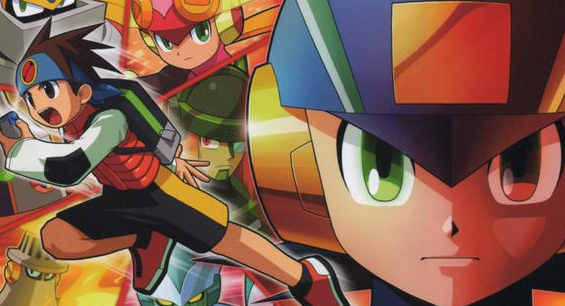 Mega Man Zero 4 and Mega Man Battle Network 2 are headed your way tomorrow, May 13th. Both games will run you €6.99 / £6.29. As for North America, we're getting Battle Network 3 White and Blue versions tomorrow. That's two whole games! Sort of! You may not realize it but new Mega Man games are still being unearthed. With a good 130+ titles on record, the franchise harbors little known software hiding in remote places on earth. Capturing these games on film is the equivalent of documenting an unknown species. In a sense, we are all zoologists. So here we are today with a rare glimpse of Mega Man X: Math Tornado; a scrappy educational game developed by Strawberry Software Inc. under license by Capcom. 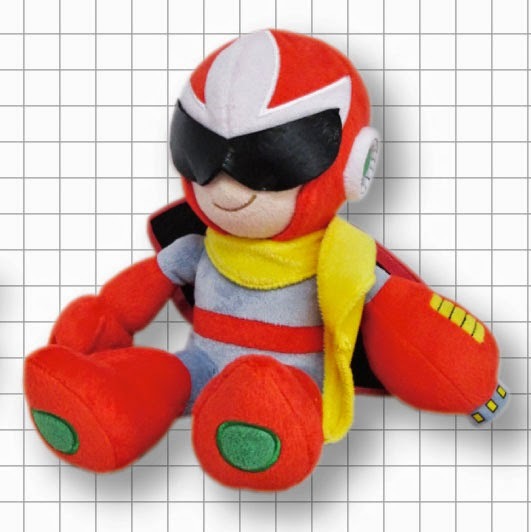 This one is about as official as Rockman Strategy, Rockman Gold Empire and other misc. Taiwan-exclusive titles. Rockman Memorial Hall provides us with some excellent footage of this oddity, and while the concept is self explanatory, you have to see this thing moving to believe it. It's ghastly. 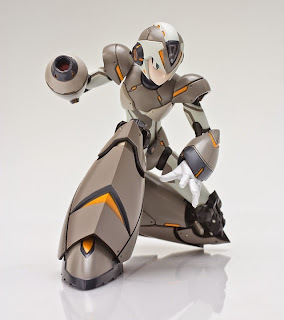 One really neat tidbit of trivia, though; this is the only game where X removes his helmet! See it at 1:07! 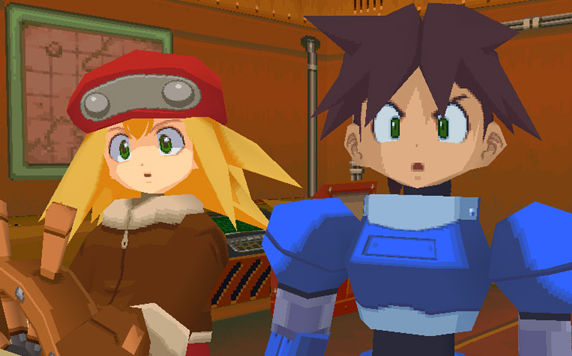 There's a couple misconceptions floating around concerning Mega Man Legends' present inability to be sold on the PlayStation Store. This post is an attempt to quell these murmurs, while at the same time provide specific examples of property infringement issues the title faces. We will discuss Mega Man Legends 2's case at a later time. For now, the spotlight is on the original 1998 classic. 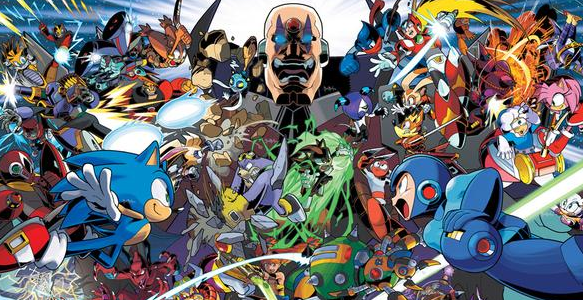 Last month you voted on which GBA Mega Man game would kick off Mega May 2015. The result is Mega Man & Bass on the Wii U Virtual Console. It's available now for $7.99. 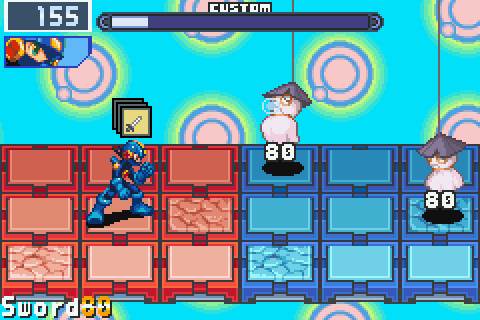 Next week is Mega Man Battle Network 3 White and Blue. You can see the full release schedule at Nintendo's Mega May hub. No sooner than it was teased, Tron Bonne has launched on the North American PSN Store today. You can play it on your PS3, PS Vita or PSP for a cool $5.99. Hey, that's a LOT cheaper than the asking prices on eBay (upwards of $200). Mind you, this re-release does not come with the Legends 2 demo. It's Tron Bonne in all its digital splendor. What are you still doing here? Go get it! 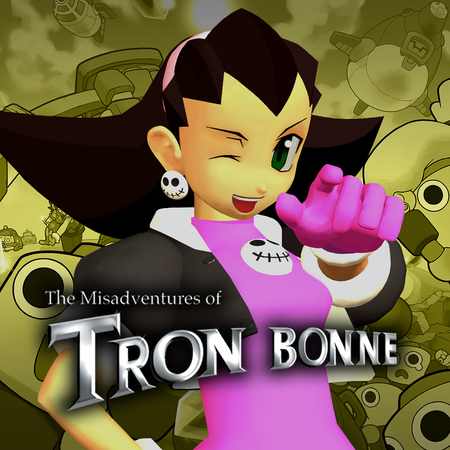 The Misadventures of Tron Bonne looks to be finally hitting PSN in North America. The title has been rated by the ESRB, with PlayStation 3, PSP and PS Vita listed as platforms. A release date is not available at this time, pending official word from Capcom US. It's great to see this happening after a long period of limbo. For the uninitiated, all three Mega Man Legends titles have struggled to launch on PSN due to property infringement issues. Mega Man Legends 1, for example, infringes on real-world products and institutions: references to Oronamin C energy drinks and YAG Animation school specifically. These logos were removed in subsequent re-releases, hence the PSP version can be sold on the Japanese PlayStation Store. 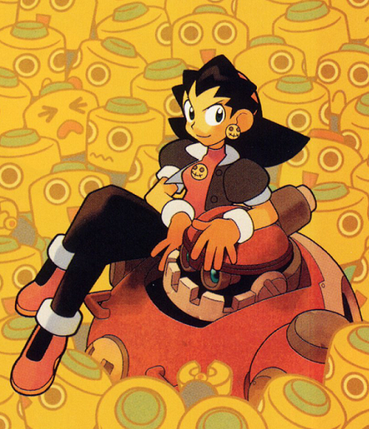 To my knowledge, Tron Bonne has always been free of logos and signage of other people's IP. So this title's hang up was seemingly related to voice overs, scores or soundtrack. Those issues have since been resolved, it seems, and the game is ready to roll out litigation free. 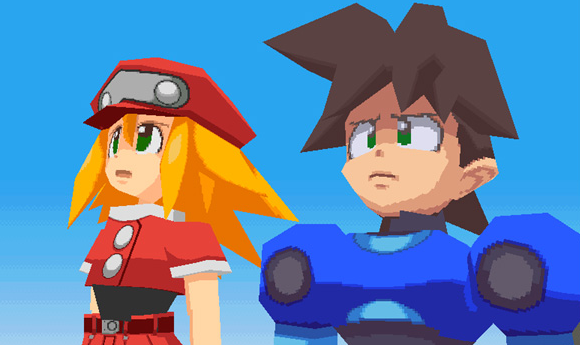 The future for Mega Man Legends 1 and 2, however, remains to be seen. We'll keep an ear to the ground. Hang tight and fingers crossed! If this recently unearthed commercial is anything to go by, sure looks like it! Spin Fighters were a brand of metal battling tops from the early 90's, predating the Beyblade craze by a few years. 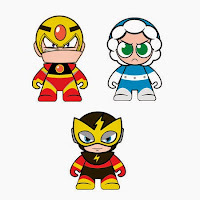 In North America, kids could buy metal tops themed after the WWF, Power Rangers and Street Fighter. Slim pickins. In Japan, dozens of licensed tops were up for grabs: Gundam, Super Mario, Slam Dunk, Dragon Quest, and yes, even Mega Man. The Japanese Wikipedia says classic and X series tops were sold at one point. They're pretty rare, it seems. Yahoo! Auctions only has one running within the last six months: Rockman 5 Stardust Crash. To think I could have been playing with these back in the day (born in the wrong country). Man. Ah well; least I can admire the commercial today. Monster hunters, take note! May's Monster Hunter 4 Ultimate free DLC pack is now available. 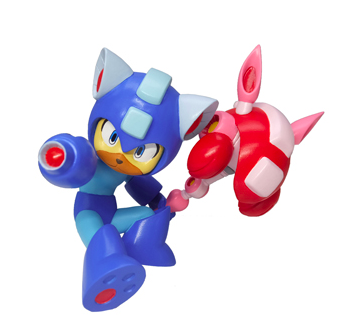 Among the many goodies within, you'll find some sweet Mega Man gear for your Palico.